View Video of Amberley Snyder. Although doctors told Amberley Snyder in 2010 that she would never walk or ride again, the Elkridge, Utah, barrel racer is preparing to compete for $1 million at The American, the world’s richest one-day rodeo, March 1 in Arlington, Texas. Snyder began barrel racing when she was 7 years old, and after her senior year in high school she won the 2009 world all-around championship in the National Little Britches Rodeo Association. Six months later, an automobile accident paralyzed her from the waist down. Now 24, Snyder defied the predictions and runs barrels competitively. She is looking forward to The American, RFD-TV’s $2.5 million rodeo presented by Polaris Ranger. Typically, contestants must earn a berth in the finals by being ranked in the top 10 in their event in professional rodeo or by qualifying through The American Semi-Finals. However, RFD-TV allowed rodeo fans to vote online for one rodeo athlete to receive a special exemption invitation. Nearly 40,000 votes were cast, and Snyder won in a landslide. At The American, she plans to ride ATP Power, a 12-year-old former racehorse she purchased nine years ago and trained to run barrels. He was voted Horse of the Year in Snyder’s region of the National Intercollegiate Rodeo Association. In the five years since her accident, Snyder has gained a new perspective. “Everything happens for a reason, and there’s a reason this happened to me,” she says. “I have zero doubt I will walk again. Five years in a wheelchair just blows my mind. But it’s not forever, so it’s okay. The opportunities have outweighed the bad things. ©Copyright 2015 Western Horsemen. All Rights Reserved. “My dad always had horses and cattle and had been on ranches. I was around the lifestyle at a very early age and I still love it. I love horses, and really all animals. My parents are both big rodeo fans and they’ve taken me along since I was young. I love rodeo and the western lifestyle,” Hayleigh said. That’s no surprise since Hayleigh is a Texas native herself. “Rodeo and bull ridings are my life. It’s so fun to watch the contestants and animals do what they do best I have a lot of friends who are cowboys and cowgirls who are my life and bring so much joy to me. Plus they are the kindest people with the biggest hearts,” she added. Hayleigh was born a micro-preemie at just 24 weeks gestation. She weighed only one pound and 1 1/4 ounces at just 11 1/2 inches long. “I wasn’t supposed to be born until September but I arrived on June 2, 1993,” Hayleigh said. Due to her premature birth, Hayleigh lives with a condition called cerebral palsy, which affects her muscle control, body movement, motor skills as well as her ability to speak. And although she’s bound to a pretty snazzy motorized wheelchair, she’s still able to communicate with a special speech device called an Echo. “My favorite saying is, “I have cerebral palsy but it doesn’t have me!” she smiles. Hayleigh’s perseverance continued throughout her youth and during school. She graduated fourth out of her class of 70 peers in May of 2011. Coming out on top made graduation even sweeter for Hayleigh. “My school years were better when everyone was younger. As we got older they weren’t as nice to me,” she added. Hayleigh, an only child, strives to live a life that’s as close to normal as possible. “The condition is not terminal but does affect my way of doing things. Some things are not possible for me, but I push harder and never give up,” she said. There are days when she is pain both physically and emotionally, but just like her rodeo friends, she is always ready to cowgirl up. “I do get upset sometimes because I’m unable to walk, talk and do things everyone else does. I just don’t want people judging me from my wheelchair or disability. I want them to give me time and get to know the real ME. Just because I’m different, I’m not less,” Hayleigh said. As long as there are cowboys, rodeos and country music, Hayleigh Lansford guarantees she’ll be their number one fan. 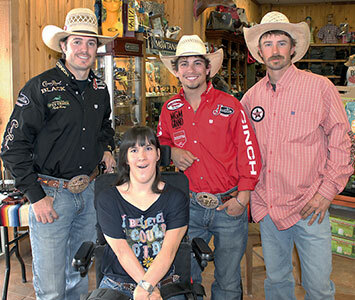 Hayleigh’s most likely met more professional rodeo athletes than many fans will meet in a lifetime. Her favorite? That’s easy. Tuff Hedeman. “I’ve always been and always will be a Tuff fan!” she said. Hayleigh’s dream came true this past April when she finally met Tuff in person. She was an honored guest at the George Paul Memorial Bull Riding in Del Rio, Tex. “Tuff presented me with an autographed back number. I’ll never forget that!” she smiled. What happened in Vegas didn’t stay in Vegas this year as Hayleigh recalled all of her special WNFR moments. She joined friend and bull rider, Cody Teel, on stage at the South Point to receive his gold buckle after winning a round. She also made a special appearance at the WNFR Exceptional rodeo. Hayleigh said, “I think that was my favorite part of the whole trip. I met Dugan Kelly and Bray Armes and they took me out of my wheelchair and put me up on the back of a horse. God allowed my muscles to relax enough for me to sit astride and not side saddle. It was a miracle and a blessing because usually my muscles won’t allow my legs to spread that far.” Hayleigh has rubbed shoulders with some of rodeo’s most famous athletes and personnel, not counting the “King” himself, George Strait. Still, she’s making a bucket list of more pro rodeos to visit this coming year and that includes the Daddy of ‘Em All, Cheyenne Frontier Days. Her schedule keeps her busy but her thoughts are never far from what keeps her going. “I hope I can be a role model and not only educate but inspire all able bodied people about what it’s like to live with and have a disability. I think being out and exposed at rodeos is a good start,” she said. One thing’s for sure, Hayleigh’s delightful attitude is certain to bring a ray of sunshine to any rodeo. If you have a story of hope that you would like to share with us, please email the story to donn@hopefortherancher.com and we will post it for our readers.